Slide board end stops, to pad or not to pad? Building a new slide board that won't have the space foot print of my other one, since I live in a smaller space now. Should I pad the end stops or just leave them as solid wood? Why? My other one is padded, which is nicer on the feet, but I don't know what, if any, impact that has on the exercise or technique. Your answer will be after a few workouts of hitting the ends and putting folded towels there, that's what I ended up doing. I have never found padding to be necessary in my (very limited) slideboard experience. The point is to push just hard enough to reach the other end. Anything more creates a sideways impact that is bad for your knees and ankles. Maybe not having padding will reinforce the idea of not overpowering. Then again, the last time I used a slideboard I was pretty young, so I likely rebounded quickly from bruising. We also wore shoes and large wool socks that acted a bit like padding. I don't think padding is a bad idea (see the aforementioned comment about the impact's being bad for knees and ankles). I just don't know that it is necessary if you use the board correctly. It just gives you a slightly bigger margin for error. I would pad them just so that you don't create pressure points on the side of your foot when you push off. It will make the barrier conform to the side of your foot more evenly. Agreed. No matter how good you are on a slide board you'll be glad it's padded. I've been making slide boards out of a material that can be taped down. It's slick as ice, last a long time, you don't need special socks and best of all it's in expensive. Can ship anywhere in the US for those interested. Find More Posts by reely? Foam that is for window stripping should work well for a bit of padding. Get the closed cell types. It comes with sticky tape on one side and you can add layers if need be. Having pointed out over the last few years here at SLF that all kinds of skating demands a push stroke that carves an arc, in order to achieve and sustain greater speeds that only centripetal acceleration can produce, I ask whether it might make more sense for there to not just be a cushion, but instead some type of a more springy mechanism that would more gradually accept the force of impact by itself sliding some small distance with the foot and also return some % of the push energy toward reversing the lateral direction of motion. Since with normal skating, the carve itself generates some "equal and opposite" push back force over a longer interval than what occurs when the foot hits a hard end barrier stop of a slide board, perhaps a few inches of springy end stop travel would better emulate cyclical leg push forces that actually occur with normal skating . such a design idea would obviously not help solve the problem of fitting a slide board in a smaller space. This is a really good idea, actually. I used pipe insulation before, and it ate up additional inches on the board. This would provide some padding without being too bulky. Armadillo, that is an interesting concept, but not something that I can design with my limited experience with the concept. I have seen boards with slanted end-stops, which may produce the same kind of body mechanics you are suggesting without the need for additional mechanical apparatus. I am going with a perpendicular end stop for this board as it should be better for training technique. I agree with you guys after further consideration to go with padding of some kind, though I will probably stumble around the hardware store a while before figuring that out. Board I got from Ikea should work well. it is a better surface material than my other board I also made from an Ikea door. It is about 25" wide, 90" long, and just more than a half inch thick. I am making end stops out of 2x4. Reely, what kind of material? A few years ago I saw slideboard plans where the stops had a 45 degree bevel on them. I assume it was so only the sole of the shoe hits the stop and not the outer foot bone. If this works it will save you the trouble of screwing around with padding the stops. It doesn't work, or at least it didn't for me. I had a slideboard like that, and all that happened was my foot slid up the stop on the pushoff most of the time. Sometimes I would also slide up the stop on the other side, and then I had to reset before I could push off again. 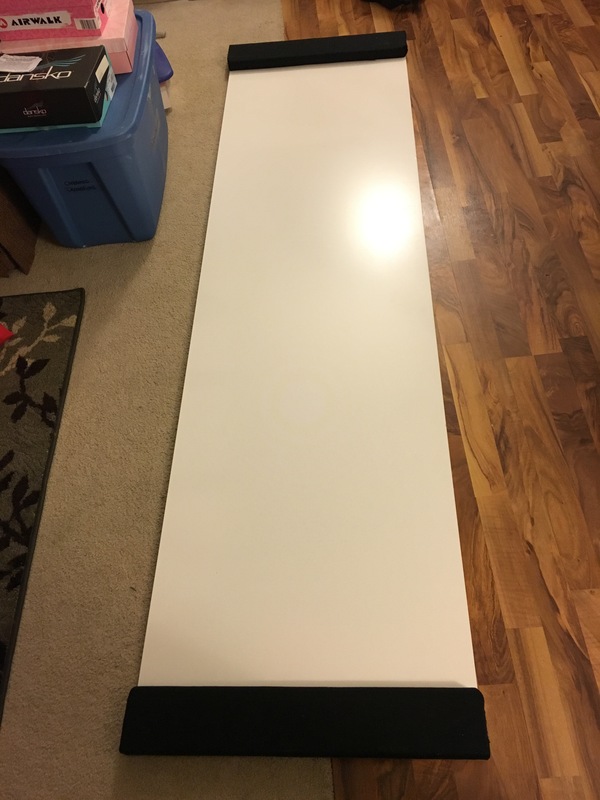 It was a cheap board, and one side was adjustable. Maybe there are some with better (or more consistent? - the people in the video that came with the board didn't seem to have too many problems) manufacturing. Went with padded end stops, using a closed cell foam window insulator. Pic follows, video how-to yet to come. Quick update. Got the first session in on this board last Friday, 12-11-15. Great set up so far. This board is super slick. I didn't need to use lubrication (usually furniture polish). Hope that lasts. The closed cell foam is great. Low profile, deadens the impact at the end stop, and provides good feedback against the push. I will edit the video together on the how-to one of these days.